What are Identity discs, tags and bracelets? Military identity tags, usually in metal or compressed fibre, are discs designed to be worn at all times and to record an individual’s identity. The British Army introduced them in 1907. They were produced within each unit, and stamped with key information, typically service number, surname and initials, regiment, and sometimes battalion and rank. Religion was also indicated. Identity bracelet that belonged to E M Earnshaw of Queen Alexandra's Imperial Military Nursing Service (Reserve). What was the purpose of Identity discs tags and bracelets? Tags were intended to show the identity of a serviceman or woman in case of capture, serious injury, or death. Religion was included so that the appropriate burial service might be provided. Thin aluminium discs were the first official types, typically made at Regimental depots on fairground-style machines, punching into the soft metal one letter at a time. The layout was rarely in perfect alignment. By 1915 the British Army requirement was to wear two official tags, both made of compressed fibre (more comfortable to wear in hot climates) and carrying identical details. These were again stamped a letter at a time. The two tags required stringing in a particular way. An eight-sided green tag with two holes was strung through one hole and hung around the neck. Through the second hole another much shorter cord was strung, which had a round red tag on it. This method allowed the red tag to be retrieved simply by cutting its short string, leaving the green tag still in place on the body. It meant that others subsequently finding a body with only a green tag would know that the death was already being reported. They could use the details on the green tag to prepare a grave marker. The official fibre tags of composite material were not trusted, especially by sailors who, correctly, did not believe that they would prove durable in water. Hence many continued to wear personal means of ID as well as official – often the official around the neck, and the unofficial as a metal wrist bracelet. 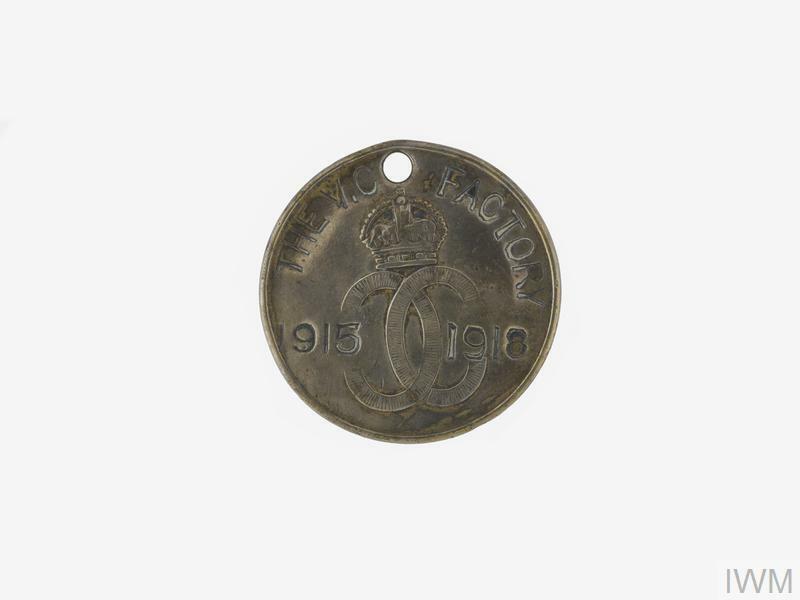 Unofficial ID tags were often made from re-worked coins. They were made in huge numbers by local craftsmen in bazaars across Africa, Asia, India and (especially) the Near and Middle East. They typically had a pre-prepared design, and simply added the name when the customer appeared. Do you have a disc that only has a number and no other details? A 1915-1918 medallion awarded to Mr Herbert Riches by the National Shell Filling Factory, Chilwell, Nottingham. Tags that carry just a number but no name may be a works ‘tally’ – collected each day by and from workers to count them into work and out again. Such systems, long used in coal mines to record how many workers were underground, were adopted at shell-filling factories, where the risk of explosion was high, so it was known how many (and sometimes who) was in a particular area. 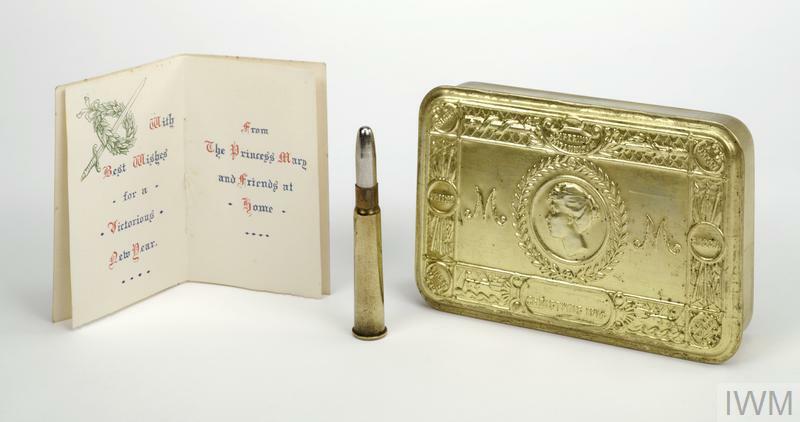 They were obvious souvenirs to acquire when the war work ceased. In addition to official and unofficial ID tags, servicemen often wrote their service details, and home address, on the back of the most treasured family photographs that they carried - in case they mislaid them, but also to help identify their bodies in the event of death. 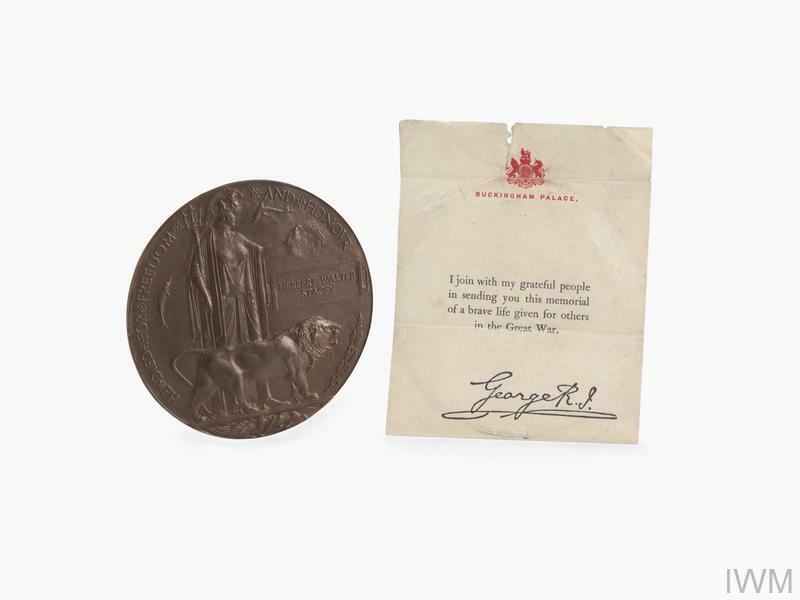 The Next of Kin Memorial Plaque is a bronze plaque approximately 11 cms or 4½ inches diameter with the name of someone who died serving with the British and Empire forces in the First World War. This was issued to the Next of Kin of the casualty along with the scroll.